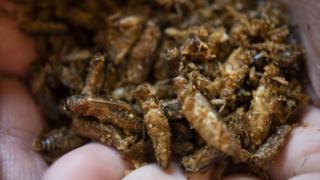 Sainsbury’s says it is the first UK supermarket to stock edible insects, and packets of Eat Grub’s smoky BBQ crunchy roasted crickets will be sold in 250 stores across the country from this week. As I put my hand into a packet of crickets with their tiny eyes and legs, the idea of one going in my mouth induced “i m feeling” a little sick. But the first bite was a pleasant surprise. A little dry and bland, but at least a wing didn’t get stuck in my throat. The smoky barbeque seasoning largely overpowered any other flavour although there was a somewhat bitter aftertaste. The manufacturer markets the snack as “more sustainable than pork scratchings” and “more exciting than a crisp”. However, sadly I’m not persuaded it is as tasty. The texture was crunchy but a bit sawdust-like and smelt a little of cat food. And it was difficult to get over the fact that it does definitely looks just like a cricket. I have to admit I didn’t have any desire to finish the packet. Eat Grub also recommends the crickets as a garnish for noodles, soups and salads. I can see how this could run as a crunchy topping to a dish but on its own it absence a bit of punch. And at PS1. 50 for only 12 g of sustenance, I’d also feel a bit short-changed buying this, although the company says it is packed full of nutrients. Eat Grub says that gram-for-gram its dried crickets contain more protein than beef, chicken and pork, as well as minerals like iron and calcium.